We are offering $250 for each person you refer to Youngbrook Recruitment, if we place them for 80 hours. If you know anyone searching for their next career move fill out the refer a friend form below or contact us on (07) 3399 6899 and let us know you have referred them or get them to mention your name. Mention this offer so we can award you the $250. We are actively recruiting for trades, supply chain, sales and marketing. 1. 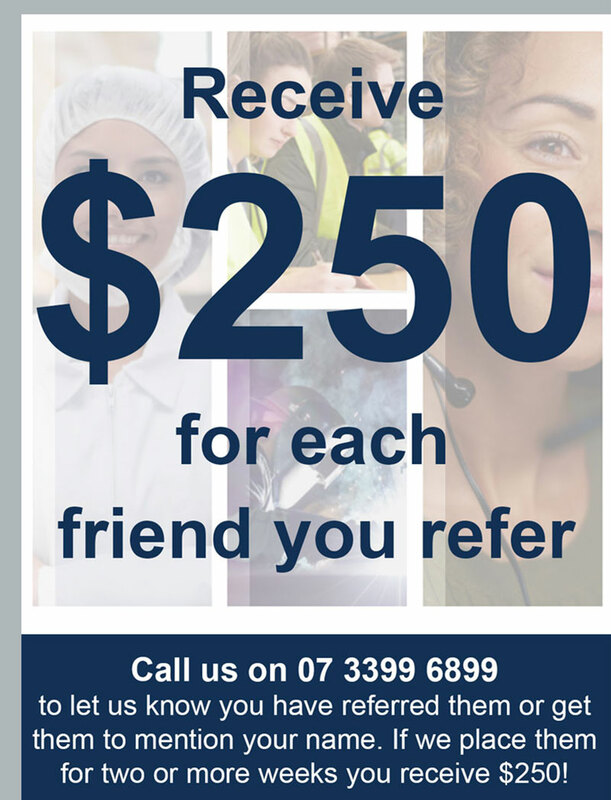 This refer a friend offer is being run by Youngbrook Recruitment Pty Ltd (ABN 78 1222 019 69) whose Brisbane office is at Level 1, 122 Lytton Road, Bulimba QLD 4171. 2. Referring a friend to Youngbrook Recruitment will be deemed as acceptance of the following terms and conditions. 3. The referred person must work for Youngbrook Recruitment as a Temporary Employee for 80 hours to receive the $250 referral fee. Alternatively, if the referred person is offered a permanent full time position the referral fee is paid once the person is placed with a Youngbrook Recruitment client and the client has paid the account to Youngbrook Recruitment (usually within 14 days from placement but may vary). 4. The referral fee is worth a value of $250, which will be awarded to the referrer in the form of a bank transfer. 5. You are encouraged to refer more than one person to claim the referral fee multiple times. 6. The referrer must be on Youngbrook Recruitment’s database of current or past candidates and employees. 7. The person being referred must not be on Youngbrook Recruitment’s database prior to the referral or if already registered on Youngbrook Recruitment’s database their file has not had any activity within the previous 12 months [1 year] prior to the referral date. 8. If any information provided by either the referrer or the candidate referred is false in any respect, Youngbrook Recruitment will not be liable to pay the referral fee. Any questions regarding the Refer a Friend Offer can be directed to Youngbrook Recruitment on 07 3399 6899.